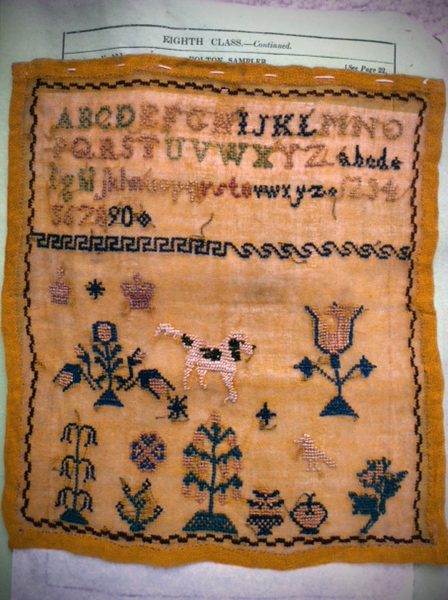 The skills taught in this book are grouped into chapters by degree of difficulty according to class year, or “division.” The First Division teaches hemming, sewing, seaming and stitching; the Second Division instructs on overcasting and marking; the Third Division advances to mending, making, knitting and platting; and so on. 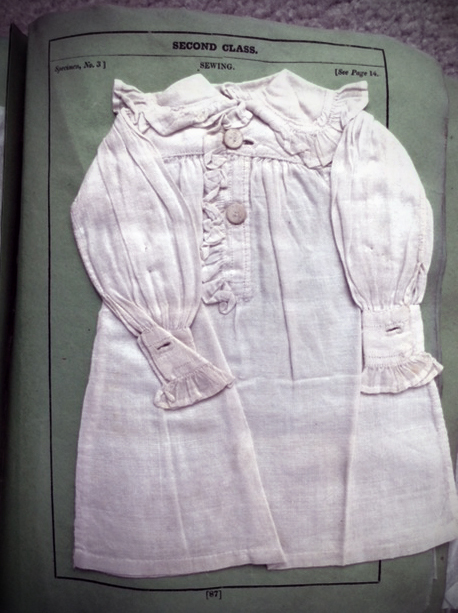 In addition to the written instruction, there are also measurement charts indicating various sizes for a given garment – for example, bibs, caps, frocks or petticoats – and the amount of fabric needed to make the intended item. 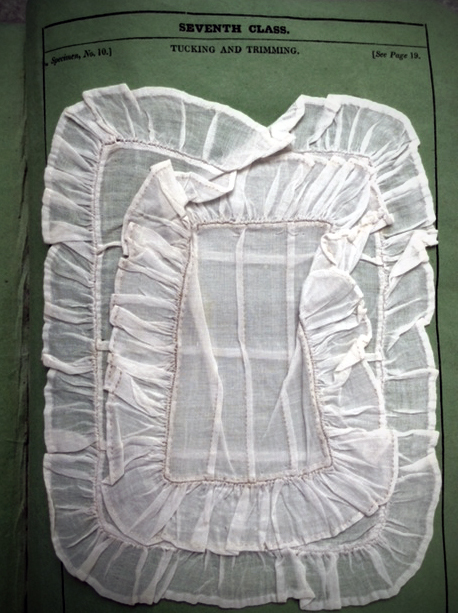 The miniature projects preserved in this book are also arranged according to class year; the earliest examples are more elementary – on the page that begins with the “First Class” specimens, there is a small square of hemmed paper and a small square of hemmed calico – and gradually advance to the elaborate “Tuscan Plat” – a project for the Twelfth Class involving tiny rows of braided straw. Each “Specimen” page indicates the page of the text where a step-by-step explanation of the featured stitch can be found. 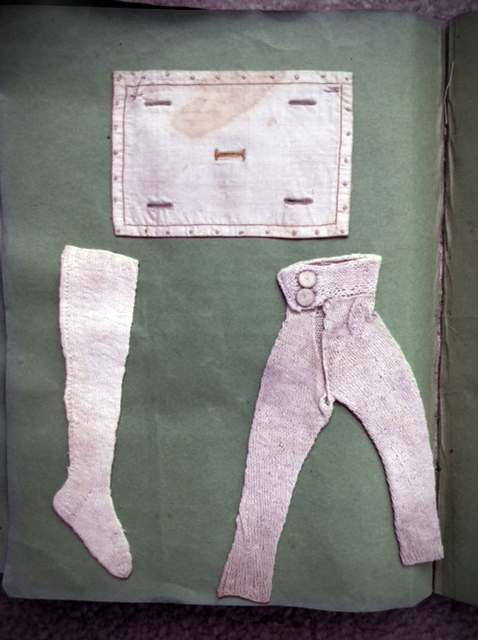 According to the “Introductory Remarks,” the samples of stitches in the book can be used to benefit both the instructors at the Model Female Schools – as a teaching aid – and the students who are learning the stitches. 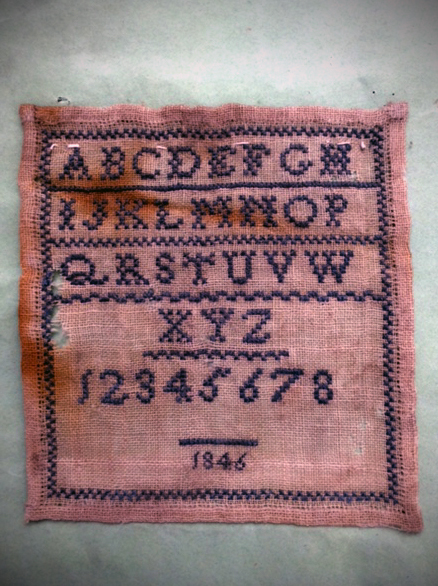 As suggested earlier, these visual examples provide teachers and students an alternate mode of understanding each stitch; indeed, mastery of the more intricate examples – “gathering and fastening-in gathers” (sixth class); “tucking and trimming” (seventh class); or “first sampler” (eighth class) – is better attained through a combination of studying the provided specimen and reading the corresponding directions. These books were in use for a number of years; several students would have contributed work to each book, therefore, every copy is different, both to the number of examples they contain and the quality of the individual pieces of work. Known surviving copies of this instructional book – include one at Trinity College, Dublin (lacking many samples), one at the National Art Library (at least one missing), one at Simmons College, and now this one. If you would like to purchase the book The Deserted School Houses of Ireland,visit the shop page here. Absolutely loved this, thank you.